Sunday’s lessons gift us with the most ordinary and extraordinary thing - seeds. And while Jesus uses the image of seeds to germinate in us the principles of the kingdom of God, it is impossible to use the metaphor of seeds without confronting modern crises having to do with seeds. How it is possible that in our brief historical life, human beings reversed nature’s explosion of biological diversity of species necessary for life on earth? The crisis we’ve caused not only in food but life on earth itself, has obvious implications for the kingdom of God. If we sow sterile seed what will we reap? The first meditation draws the reader to an appreciation of the evolutionary development of seeds and their reproduction with a quote from Loren Eisley’s famous essay How Flowers Changed the World. The second meditation expresses the wonder of seed in the human hand. The third meditation references Vandana Shiva’s activism around seed preservation. By contrast, the true flowering plants (angiosperm itself means “encased seed”) grew a seed in the heart of a flower, a seed whose development was initiated by a fertilizing pollen grain independent of outside moisture. But the seed, unlike the developing spore, is already a fully equipped embryonic plant packed in a little enclosed box stuffed full of nutritious food. Moreover, by featherdown attachments, as in dandelion or milkweed seed, it can be wafted upward on gusts and ride the wind for miles; or with hooks it can cling to a bear’s or a rabbit’s hide; or like some of the berries, it can be covered with a juicy, attractive fruit to lure birds, pass undigested through their intestinal tracts and be voided miles away. The ramifications of this biological invention were endless. Plants traveled as they had never traveled before. They got into strange environments heretofore never entered by the old spore plants or still pine-cone-seed plants. The well-fed, carefully cherished little embryos raised their heads everywhere. Many of the older plants with more primitive reproductive mechanisms began to fade away under this unequal contest. They contracted their range into secluded environments. Some, like the giant redwoods, lingered on as relics; many vanished entirely. The industrial era at climax...has imposed on us all its ideals of ceaseless pandemonium. The industrial economy, by definition, must never rest....There is no such thing as enough. Our bellies and our wallets must become oceanic, and still they will not be full. Six workdays in a week are not enough. We need a seventh. We need an eighth....Everybody is weary, and there is no rest....Or there is none unless we adopt the paradoxical and radical expedient of just stopping. The great Ice Age herds were destined to vanish. 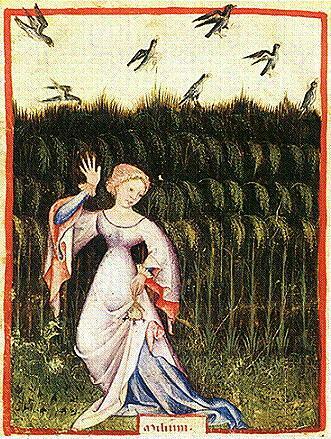 When they did so, another hand like the hand that grasped the stone by the river long ago would pluck a handful of grass seed and hold it contemplatively. 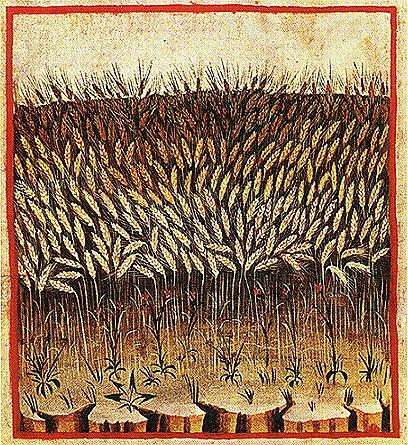 In that moment, the golden towers of man, his swarming millions, his turning wheels, the vast learning of his packed libraries, would glimmer dimly there in the ancestor of wheat, a few seeds held in a muddy hand. Imagine a lonely ancestor, 11,000 years ago, exiled or driven from the tribe, living off the grasslands on a veld high above the inhabited valley. Mother and daughter notice that the grasses at this elevation seem ripe, but their seeds do not explode the way the grasses do lower in the valley. Mother and daughter also notice that where seeds have fallen, new sprouts emerge in clusters, sometimes even in the shape of the head of grain. The little girl does not know the word “exponential” but she understands the concept. Each thin green sprout yields one or more clusters of seeds which in turn yield more clusters. She loves thinking about clusters yielding seeds yielding sprouts yielding more clusters. She imagines them in her head until she can't imagine any more. Mother and daughter begin a game. They take about 25 of their favorite grasses from the veld, sorting out the plumpest of the individual grains, putting them into the soil. The child creates spirals and other patterns with them while her mother simply pushes them randomly in. And as the grains mature each in their own time, they again reserve the plumpest kernels and plant them and eat the rest. And in a short time, the mother and daughter have a small paradise of grains to accompany their foraging of roots and berries and bark and insects. In a dry spell, they notice the new plants withering, and so the little girl runs to a high pond with an animal skin and brings back water. Immediately they see the sprouts revive and for the rest of the day they carry water to their little haven of grain. Their field flourishes. The grains themselves adapt to the elevation and micro-climate, becoming stronger and thicker, and plumper. Some seeds cross. Some become more bitter, some sweeter, some starchier. Mother and daughter keep a mental record of every kind of grass, it's maturation time, it's taste, and its ancestry. I cannot believe that my young mother and her clever little girl 11,000 years ago did not perceive with awe the miracle of growth any less than I do today. In fact, because of their sharpened senses, they understood awe and seeds better than I ever can. Jesus had a sense of awe for seeds. “The kingdom of God is as if someone would scatter seed on the ground, and would sleep and rise night and day, and the seed would sprout and grow, he does not know how. 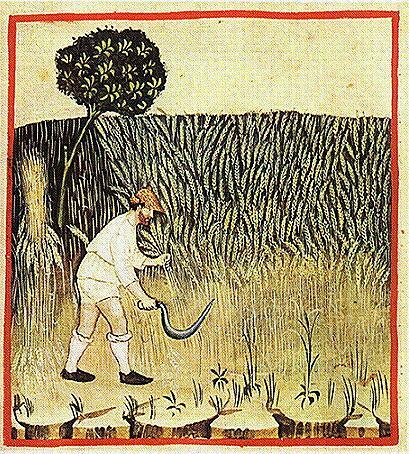 The earth produces of itself, first the stalk, then the head, then the full grain in the head." “He sees not how!” So it was 11,000 years ago, so it was with the Son of God, so it is with us. But Jesus takes this sense of awe about this unknown energy, what happens to a seed, and applies it as analogue to something else unseen, that is, the kingdom of God. And in carrying the seeds of the kingdom, we are as pivotal as my exiled seed loving ancestors in changing the world.